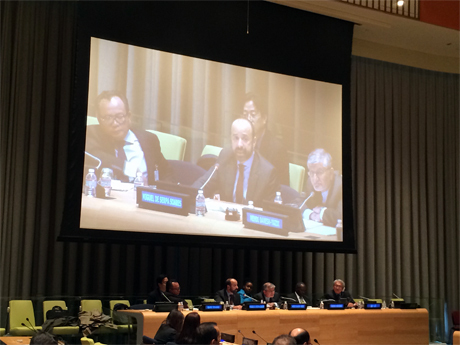 United Nations Legal Counsel addresses AALCO high-level event at UNHQ. On 24 October 2014, the Legal Counsel, Mr. Serpa Soares, addressed an Asian African Legal Consultative Organization (AALCO) high-level event entitled "International Law Today: Perspectives and Challenges". Over decades, the cordial partnership and close cooperation between the United Nations Office of Legal Affairs and the Asian African Legal Consultative Organization has been a priority for the Legal Counsels of the United Nations. Mr. Serpa Soares continues this well-established tradition. In his intervention, Mr. Serpa Soares presented some personal observations on the topic of promoting and applying international law. Mr. Serpa Soares participated in the first panel together with H.E. Mr. Mehdi Danesh-Yazdi, Deputy Minister of Foreign Affairs of the Islamic Republic of Iran and President of AALCO, H.E. Mr. Tuvako Manongi, Permanent Representative of the United Republic of Tanzania and Chairman of the Sixth Committee, and Dr. Rahmat Mahamad, Secretary-General of AALCO. The AALCO event was an important prelude to the 2014 "international law week" which will begin on 27 October 2014.